When jeweler-to-the-stars Elena Eaton is ensnared in a daring jewelry heist on the night of the Academy Awards, she discovers that nothing in La La Land is as it seems. As her sterling reputation and private life suddenly turn into tabloid fodder, a family emergency draws her back to her hometown of Sydney, Australia. With her family's rare blue diamonds from India missing and her career in jeopardy, her problems mount when an infuriatingly handsome insurance investigator, Jake Greyson, follows her to Sydney, suspecting her of involvement in the robbery. Yet Elena's grandparents see more in Jake than she does. After a night at the opera and a walk on the beach, Elena and Jake soon find themselves more attracted to each other than either of them planned. But can she trust him with an old family secret regarding the rare diamonds? 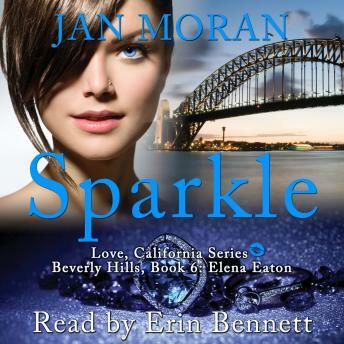 Sparkle is the sixth book in the Love, California series of linked, stand-alone novels. Follow a group of smart, stylish friends as they navigate the turbulences of modern life and dating. Set in Southern California with international travel, this fun, heartfelt series features a group of best friends determined to live the lives of their dreams.